So this is the post I was going to start when I ended up writing this post instead. Yes, it's not Wednesday anymore, but what areyagonnado? This is a pic of a little boys t-shirt. I'm not really sure why a person would put their kid in a shirt like this, because it's calling the kid's dad dumb. 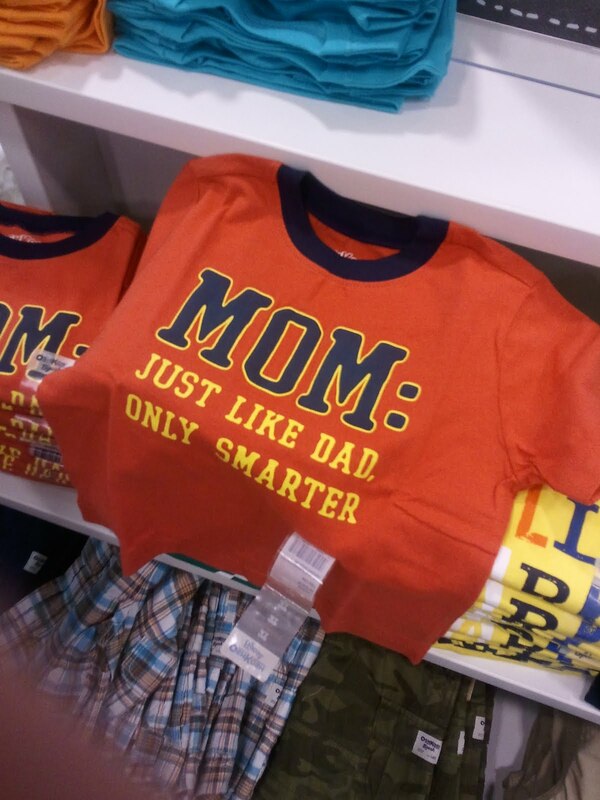 I'm not going to call it reverse sexism or anything like that, but can you imagine if there was a shirt that said, Mom: Like dad, only dumber-- there would be a huge problem. This shirt is a good illustration of something that can happen when someone is really mean to someone else and then the second person gets a little bit of power. I was going to say oppression instead of really mean to someone , but something about that word is rubbing me the wrong way today. Maybe because it's because I've been doing a lot of reading and seeing it too much, maybe because I feel like it's overused, maybe because I know people read words like that and roll their eyes and say, "Oh, come on!" Anyhow, another example like this shirt is the trend of calling certain women real women . Like, "In this commercial/magazine article/etc. we're featuring real women ." Usually they are referring to women who are not professional models and/or weigh more than what the dominant culture puts out there as being the ideal body size for a woman. I understand that it is important to show that there is diversity among women, and that that diversity is beautiful. But I don't think that it needs to be done in such a way that puts down the group that has seemingly benefited from the screwed up standard that existed before. Like with the t-shirt: it's important to value the contribution that mothers make to raising their children, without framing it in a way that makes fathers look like dumbasses. This whole thing reminds me of Animal Farm. If you haven't read Animal Farm, but are planning to and don't want any spoilers, skip on to the next paragraph. The animals are being exploited by the farmer, the pigs lead the animals in a successful revolution, and then the pigs become the ones doing the exploitation. It makes me wonder if, as marginalized groups get more and more power, they are going to fall into the same trap that the people who originally had the power fell into. The idea that power is best utilized by elevating your status over the status of others, and gaining a large sense of your identity from this elevated status. If marginalized groups buy into the myth that the people with the power have wonderful lives, it's just going to cause them to try to emulate the same behaviors, which is going to lead to the same problems. I think it is more beneficial to look at how the current system is harmful to everyone, even the skinny women and seemingly powerful men. Because if we can do that, we can work to set up new ways of functioning that don't include us just falling back into our old habits. Milton Friedman's son was on the radio this week talking about his project to start new floating nations using technology, which he predicted would be Utopias because the sea is a frontier that no one owns, and so there would be no establishment structure to over come and thus it would be easy to start a brand new society. Sounded like the Puritans to me. All of which is to say I sure do agree with you DeAnna. We have to create change where folks give up the use of power to get what we want.